Most regional forms belonging to this species have a frosted blue color and grow between 6-9 ribs. 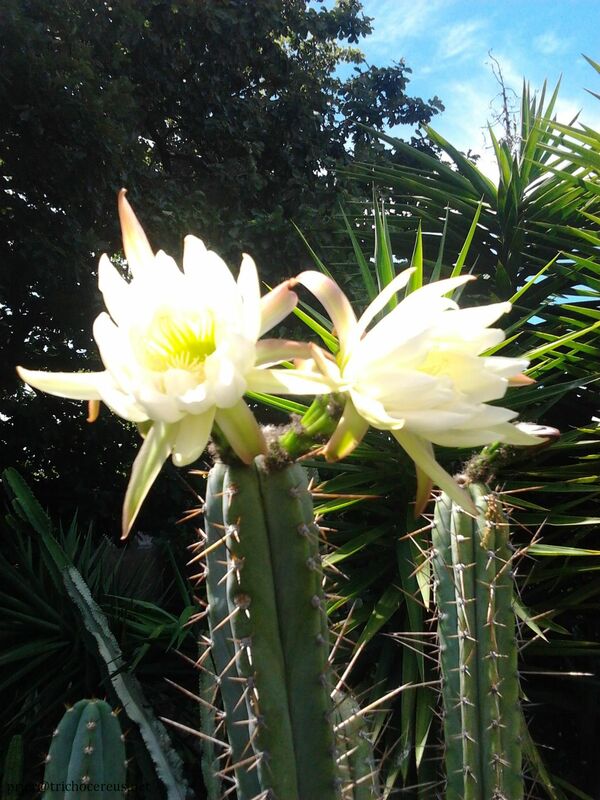 Its flowers are white, though there are some close relatives that have a different flower color (Trichocereus tulhuayacensis). It usually grows upright, but sometimes grows prostrate hanging down from cliffs and rocks. The size and color of the spines varies greatly, but most of them have about 6-8 honey-colored to brown spines that can reach about 4 centimeters in length. The areoles are brown to beige-felted and up to 2,5 centimeters distanced from each other. The Spines do NOT have a knobbed Base. The spine color is one of the key traits if you attempt to tell it apart from Trichocereus macrogonus. We write more on Trichocereus macrogonus in that particular chapter. A Peru at the type locality in Matucana. Echinopsis peruviana flowers very easily as soon as it reaches a certain size and the plant is very easy to cultivate. Some of them have a distinct V-Notch above the areoles, but not all and it´s not a trait that is reliable for identification. 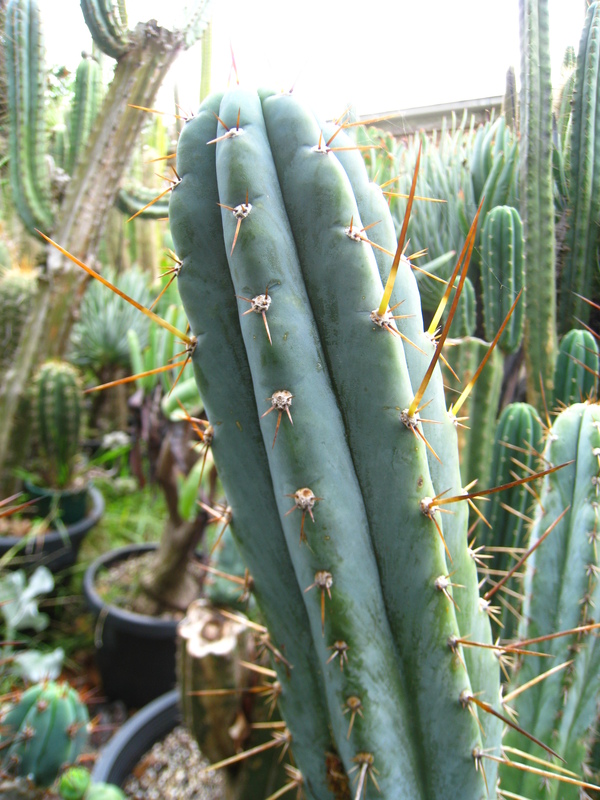 Trichocereus peruvianus can be grown from seed 0r propagated by cuttings. Seeds need to be sprinkled on top of the soil because they require sunlight to germinate. The seeds are tiny and only a few mm large and have a long viability. Usually, the seeds can stay viable for up to 10 years or above, though that depends on many factors. The Seed needs to be stored in a dry and cold environment to guarantee maximum viability. The cactus can also be propagated through cuttings and it´s very easy to root. But make sure that the cuttings are not smaller than 20 centimeters because that stunts the growth tremendously. The flower is white and reaches as size of up to 25 centimeters. 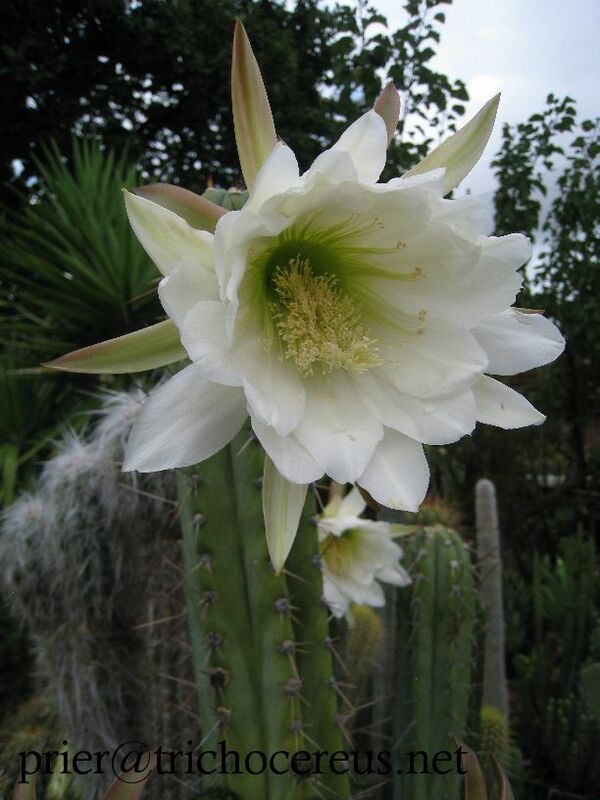 Trichocereus peruvianus is a night flowering species. Peru (around Matucana). Trichocereus peruvianus is the dominant Trichocereus species in Matucana. Trichocereus peruvianus and Trichocereus pachanoi are sister species and closely related. Some field botanist considered them one large and variable species and there are countless intermediates and hybrids that could be placed in either species. Around 1950-1980, some authors came up with a large number of unnecessary species names and most of these plants would fit into the description of Trichocereus peruvianus as well. Some commercial names that we sometimes see in combination with Trichocereus peruvianus. Trichocereus peruvianus var. (H14192), Huntington, EE.UU. Trichocereus peruvianus var. huancabamba, Piura, northwest Peru. Trichocereus peruvianus var. huancavelica (KK242a), west central Peru. Trichocereus peruvianus var. cuzcoensis (KK340), Huachac, Cuzco, southeastern Peru. Trichocereus peruvianus var. huancayo (KK338), west central Peru. Trichocereus peruvianus var. ancash (KK1688), San Marcos, Ancash, northwest Peru. Trichocereus peruvianus var. matucana (KK242) Lima, central west Peru. Trichocereus peruvianus var. puquiensis (KK1689), Puquio, Apurimac Region, southwestern peru. Trichocereus peruvianus var. trujilloensis, Trujillo, La Libertad, northwestern Peru. Trichocereus peruvianus var. tarmensis (KK2148), Tarma, Junin, west central Peru. Trichocereus peruvianus var. Rio Lurin (KK2147), Rio Rimac, Lima, west central Peru. Trichocereus peruvianus var. ayacuchensis (KK2151), southwestern Peru. Trichocereus peruvianus var. huaraz (KK2152), Ancash, northwestern Peru. The culture of Trichocereus peruvianus is not very hard. The plant has very similar requirements as other Trichocereus species like Trichocereus macrogonus or Trichocereus pachanoi. 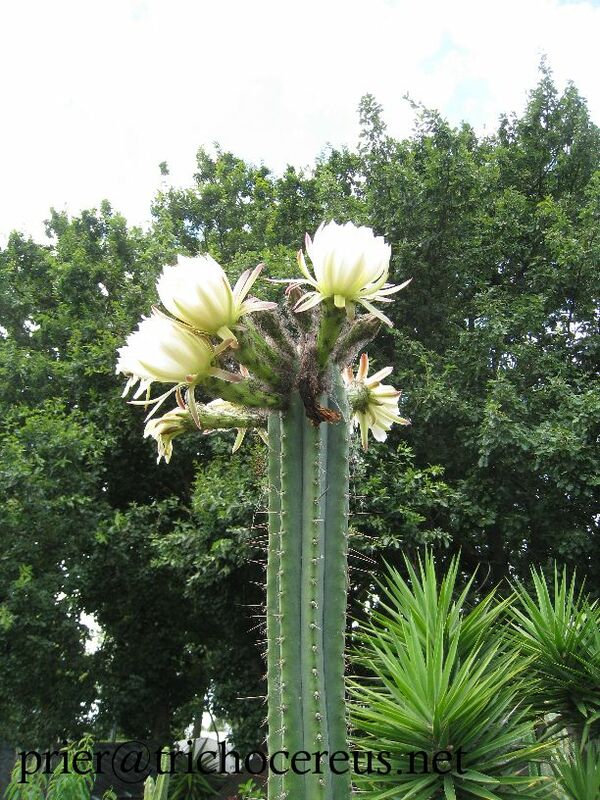 Trichocereus peruvianus is an extremely frost resistant plant that can thrive in the most difficult environment. Some of its forms grow columnar while some others are creeping/prostrate. In their natural habitats, they even hang down on hills or rocky slopes. When watering cacti, the soil should not stay wet for more than a couple of hours because it greatly increases the probability of rot. Cacti need a substrate that dries out fast and too much water is often deadly for them. 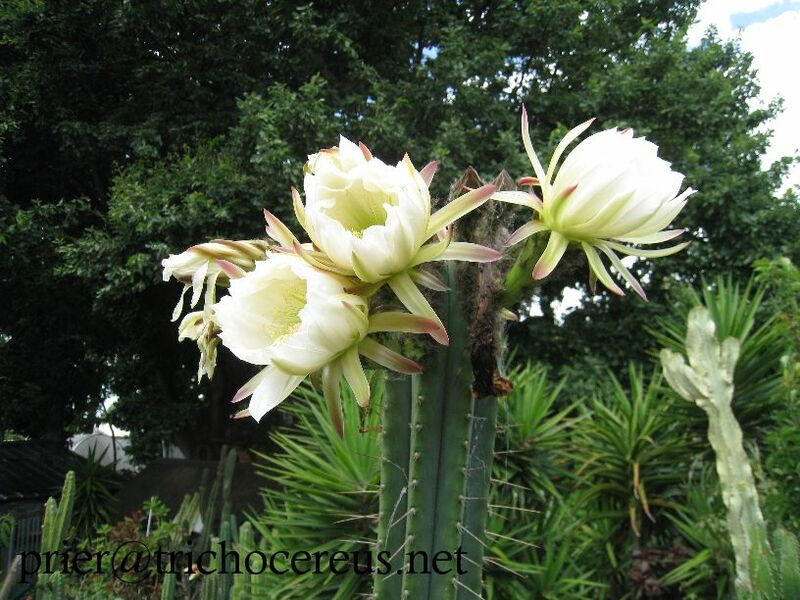 Apart from a little bit of water here and there, you should only water Trichocereus peruvianus when it´s warm. During the hot growth-season, they can take daily or weekly watering and like to be fertilized on a 7-14-days schedule. I even fertilize weekly during the main season, but that also depends on your personal way of growing cacti. It’s best to use a mineral substrate like Pumice or Lava, with additives like Coir, Sand, Sowing Soil, Expanded Clay etc. Just make sure to add in a very small part of Coir or Humus because it helps to solidify the soil and increases the cactus ability to take in nutrients. I personally love Lava and Pumice and the plants enjoy it very much! Echinopsis peruviana aka Trichocereus peruvianus likes a sunny place in half-shade, but not full sun. They can take it if they are used to it, but it increases the risk of sunburn. Especially directly after the winter period when they are not used to it yet. 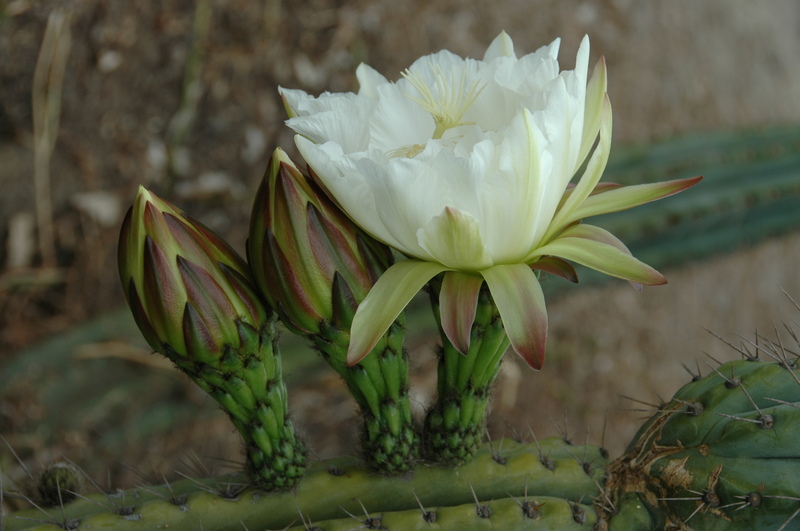 Winter & Frost Protection: Trichocereus peruvianus is a relatively frost hardy cactus. It’s usually not a problem for it to take take a little night frost here and there and is tolerant down to -9° Celsius. But that’s really the limit and I would not be comfortable to push it below that. There are always plants are less frost tolerant than others and you never know where the limit for your plant is going to be. A plant that spent its life in a heated greenhouse, will die very soon if you suddenly start exposing it to cold winter frost. The cacti need to be hardened up and in a good general health. In my greenhouse I overwinter Trichocereus at 1° Celsius between December and March. The ideal average winter temperature for Trichocereus peruvianus is 10° Celsius. That´s close to their natural winter period in habitat. 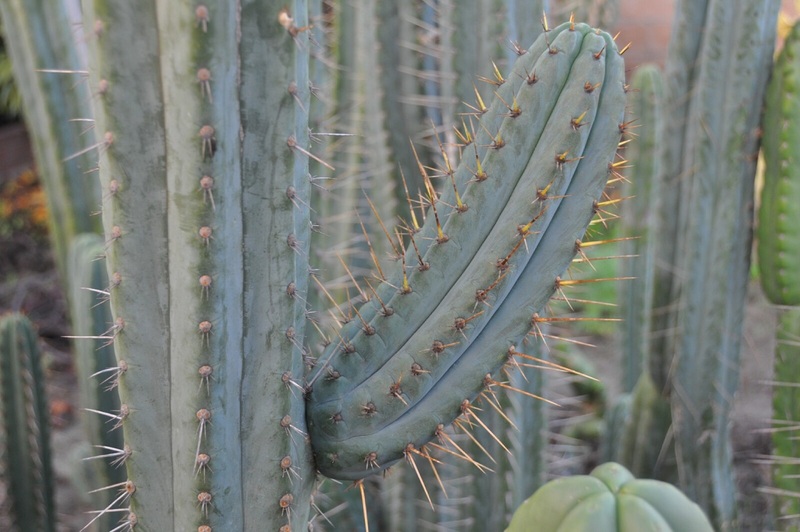 Trichocereus peruvianus can compensate short frosts down to 15.8° Fahrenheit every now and then but you should take care that it has an average temperature of around 50° Fahrenheit. Trichocereus peruvianus needs fresh air during the wintertime if you want to overwinter the plant inside. It also needs light and the soil has to be completely dry, to make sure that the rootstock does not rot. This is important because that’s exactly what happens in the habitat during the winter time. 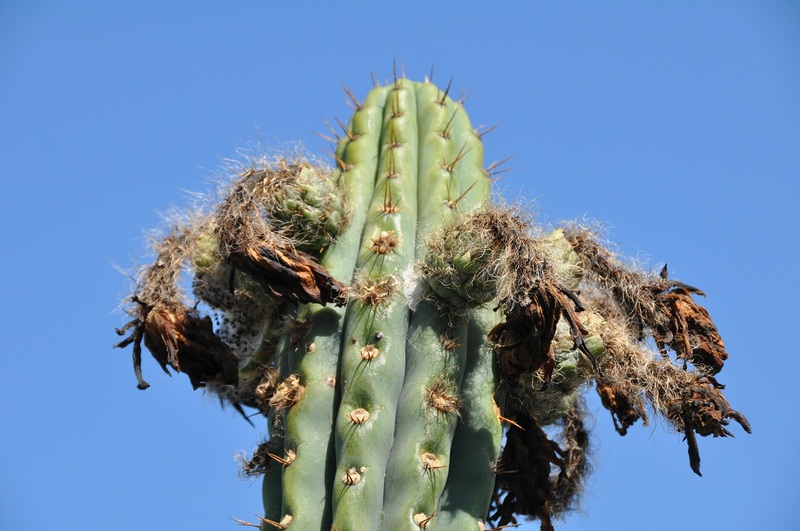 Trichocereus peruvianus can deal with low temperatures as long as its dry. Of course all those overwintering-rules only apply of you live in a country with hard winter frost down to -20° celsius and lower. If you live in a warmer country such as Australia, this certainly is not a problem for you and water or high air humidity are the bigger problem then. I also know many growers from the CA area in the USA, and they usually get their plants over the winter without problems, if they do nor get surprisingly cold frosts. Leave your Trichocereus peruvianus in a bright room, give it a little bit fresh air every now and then and make sure to keep the temperatures below 10° Celsius. As soon as you put them in a heated room, they will require regular waterings and light or they will die quickly. In addition they will etiolate. If kept dry, the water requirements during the winter are minimal though. The minimum temp in Fahrenheit is 50° Fahrenheit. No water should be given between late autumn (October-early May) unless you grow them in a heated place, eg greenhouse or house. If you are lucky enough to have a greenhouse, you can take out most Trichocereus in early March, but you should also check the maximum frost tolerance of the species you take out. 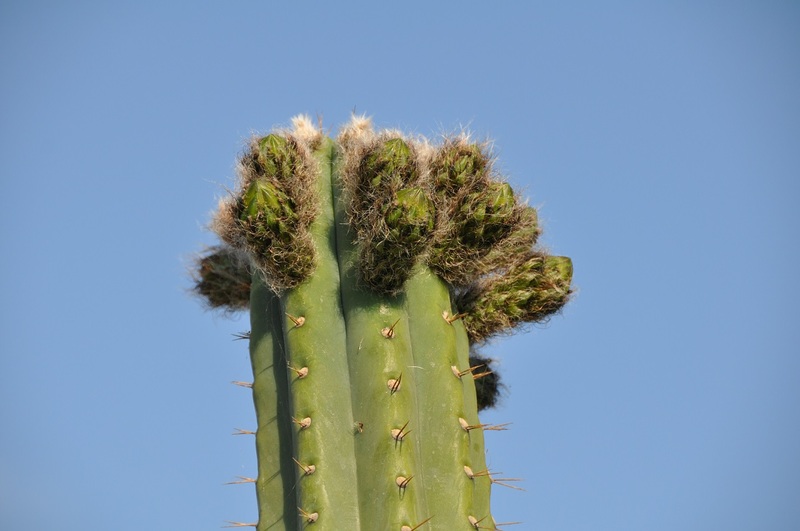 There are many cacti that need higher temperatures to stay healthy. Just like Seed of other Trichocereus species, Trichocereus peruvianus seeds need light to germinate. I usually prepare a mix of Pumice, Lava, Coir, and Sand and and sprinkle the seeds on top of the soil. Make sure not to knock off the sowing container/pot because that would probably bury the seeds and that’s never a good thing. Buried seeds often do not germinate due to the lacking light or they germinate deep inside the soil and die. So yeah, sprinkle them on top of the soil and make sure that the temperatures are between 26° and 30° Celsius. Make sure to add in enough water to start the germination process. However, it does not take a lot of water to kick start the germination and it’s always better to give very little water early on because you can always add in some more. But if you add too much water in the beginning, it cannot be undone without risking to wash or soak away the seed with the excess water. With a syringe, excess water can be removed from the sowing container. Put the sowing containers in a bright and warm place and be patient. A window sill works perfectly. You can also use a LED lamp to give them enough light to germinate and I can recommend that very much because it increases the germination rate. Adding a decent LED Lamp (like 100 Watt and above) will increase germination rates dramatically and the plants are healthier and grow faster. The problem with seeds is that some shops resell seed from South America wholesalers that sell over-aged seed. So the shops might not know about the bad germination rates that their seeds have and that´s a real problem with Trichocereus peruvianus seed on the market. If you did everything I just mentioned and your seed does not germinate within like 2-6 weeks, it´s most likely old garbage. It does not help to keep it wet for longer than that because that’s not how germination of cactus seeds works. Instead, you let it dry and start another cycle once the soil is completely dry. It does not help to keep dead seed in germination chambers for 6+ weeks. You will just grow Algae and Moss. Another problem that you can get with commercial seed is that there´s a lot of misidentified seeds of this species available on the market. The people who collect these seeds usually don´t have access to literature and that´s why the misidentification rate is extremely high. . Many Trichocereus cuzcoensis are sold as Trichocereus peruvianus and that´s a big problem for the seed market. My best recommendation is that if you can get in touch with the seed producer, send them a message and ask about a pic of the mother plant. That way, you can minimize the risk of getting mislabeled seed. The seed of Trichocereus peruvianus is viable for many, many years. I sometimes successfully germinate seeds that are more than 5-10 years old but it always depends on the storage and the seed. Some are dead within a couple of months while some can even stay viable for decades, like Ariocarpus seeds. The bigger the seed, the longer they are viable btw. Rebutia are dead within a couple of weeks, Trichocereus & Echinopsis 5-10 years, Ariocarpus 10+ years, Echinocereus (5-10 years), Lophophora (2-5 years at max). How to differentiate Trichocereus peruvianus and Trichocereus cuzcoensis? Both species are probably synonymous. Trichocereus macrogonus was used for plants with dark brown or red spines, while plants with different spine color were seen as Trichocereus peruvianus. The original description of Trichocereus macrogonus is ancient, lacked important traits or information such as country of origin and the original plant was never found again afterwards. Technically, Trichocereus macrogonus is the older name and might replace Trichocereus peruvianus as official name one day (IF the problematic description will be accepted). Some authors have already started to use this system, but is unclear if it will be accepted officially. Modern taxonomy moves towards fewer species, with a larger number of subspecies or varieties and I completely support that. Another one that is treated as Trichocereus macrogonus / Echinopsis macrogona. This is one of Misplant´s mother plants. You can get some seed here! Another one of Misplant´s mother plants. You can get it´s seed here! zahlreich nach dem Scheitel zu entwickelt. TRICHOCEREUS PACHANOI FORMA PERUVIANUS RITT. comb. nov.
denn solche Erbformen pflegt man an sich nicht taxonomisch zu benennen. solche von einer Bl. (mit Foto) eines Exemplars östlich von SAMNE, Prov. graugrünen Schuppen und schwarzen, 15-25 mm langen Wollbüscheln. Stbf. nach außen gebogen. Einige Samenangaben siehe unter TRICHOCER. KNUTHIANUS. Nr. FR 567 (Form PACHANOI) und Nr. FR 155 (Form PERUVIANUS).